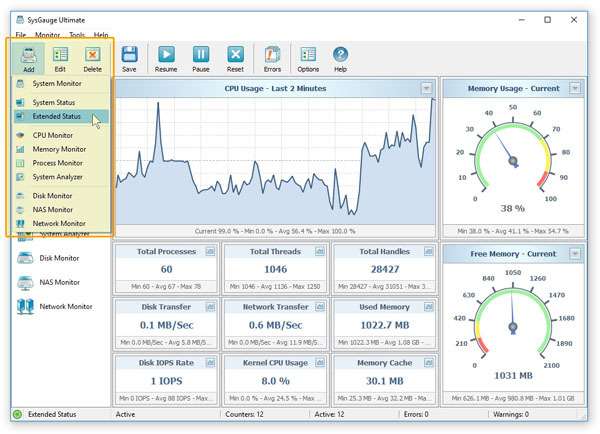 The SysGauge system monitor allows one to monitor remote servers via the network. In order to connect to a remote server, press the right mouse button over a monitor item in the left-side view and select the 'Connect To Remote Computer' menu item. On the 'Connect' dialog, specify the host name or an IP address of the remove server to connect to and press the 'Ok' button. 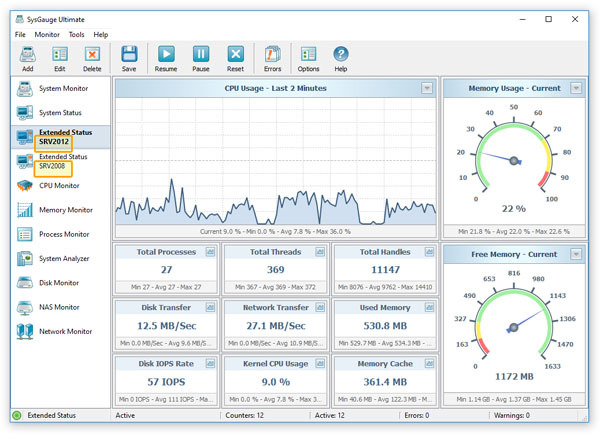 Once connected to a remote sever, SysGauge will display the remote server name under the monitor name in the left-side view and all system monitoring counters will display the status of the remote server. Each system monitor can be connected to a different remote server allowing one to monitor a number of remote servers via the network. Also, users are provided with the ability to configure a number of monitors of the same type connected to different servers via the network. For example, in order to add two extended system status monitors configured to monitor two different servers via the network, press the 'Add' button located in the top-right corner of the main toolbar and select the 'Extended Status' menu item. 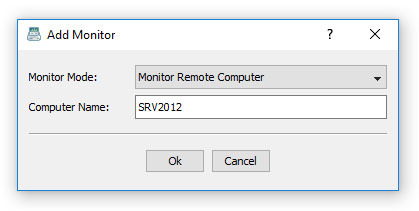 On the 'Add Monitor' dialog, set the monitor mode to 'Monitor Remote Computer', specify the host name or an IP address of the remote server to connect to and press the 'Ok' button. 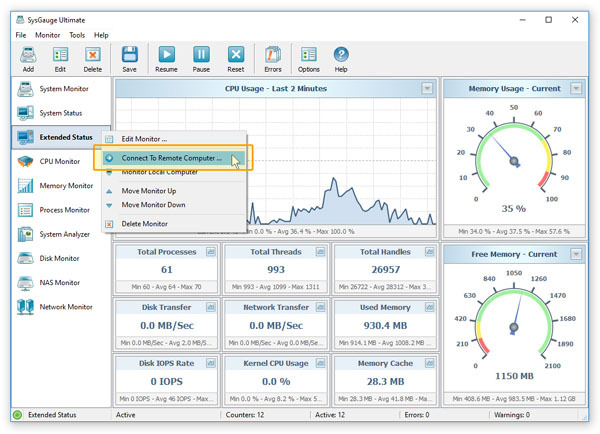 SysGauge will add a new system monitor to the product configuration, display the name of the remote server under the monitor name in the left-side view and all system monitoring counters will display the status of the remote server. In order to change the position of a system monitor in the left-side monitors view, select the monitor item, press the right mouse button and select the 'Move Monitor Up' or 'Move Monitor' down menu item. In order to disconnect a monitor from the remote server and switch back to the local computer, select the monitor item in the left-side view, press the right mouse button and select the 'Monitor Local Computer' menu item. In order to remove a monitor from the product configuration, select the monitor item, press the right mouse button and select the 'Delete Monitor' menu item. 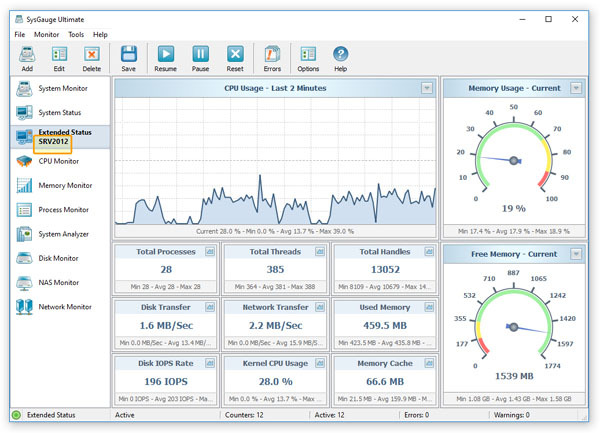 Another option is to use the SysGauge system monitoring module, which provides the ability to configure user-custom system monitoring profiles and allows one to specify a remote server name for each system monitoring counter individually. In order to add a remote system monitoring counter, select the 'System Monitor' module in the left-side monitors view, press the 'Monitor' button located on the main toolbar, press the 'Connect' button located in the bottom-left corner of the 'Add Counter' dialog and specify the host name or an IP address of the remote server to connect to. 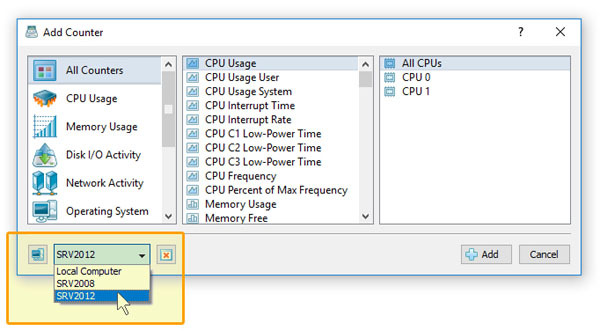 Once connected to the remote server, select an appropriate system monitoring counter and press the 'Add' button. In order to monitor a number of different servers via the network, add all the required remote system monitoring counters and for each counter specify an appropriate host name. The SysGauge system monitoring module displays the currently active counter list in the counters view, which is located on the bottom-side of the SysGauge application window. For each system monitoring counter, the counters view shows the counter name, the counter instance, the counter remote server name, the current counter value, the average value, the maximum value and the minimum value. In order to be able to connect to a remote server via the network, the remote server should be properly configured. The exact server configuration depends on the version of the operating system installed on the server, but in most cases the remote server should have the 'Performance Counter DLL Host' service and the 'Remote Procedure Call (RPC)' service enabled. 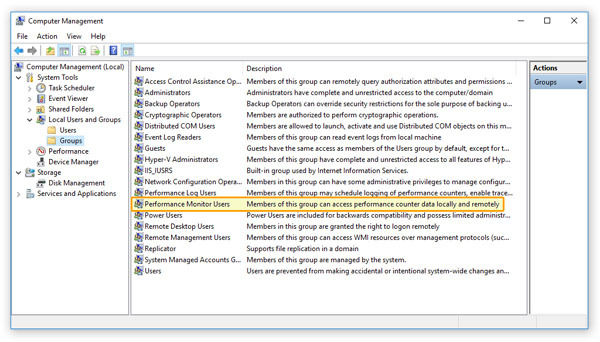 Also, the user account running the SysGauge application should be added to the 'Performance Monitor Users' group. In order to enable services required for remote server monitoring, open the Windows control panel, open the 'Administrative Tools' folder and then open the 'Services' applet. 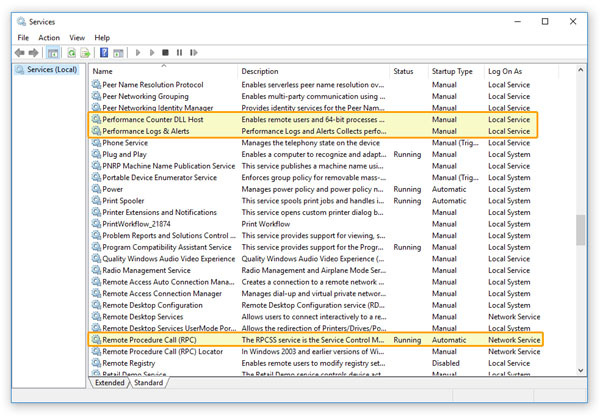 On the 'Services' applet, enable the 'Performance Counter DLL Host' service and the 'Remote Procedure Call (RPC)' service. 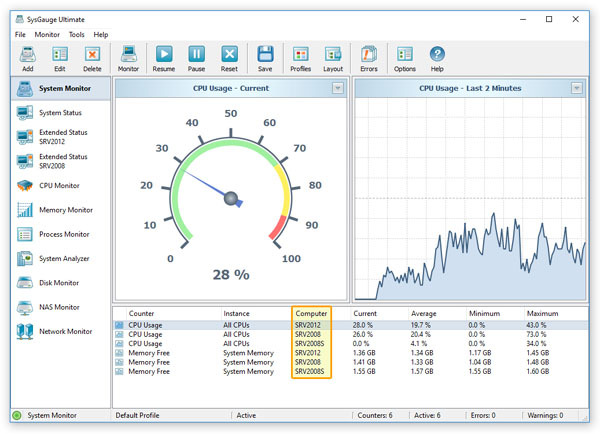 Once finished configuring the required Windows services, open the 'Computer Management' applet, open the 'Local Users and Groups' folder, open the 'Performance Monitor Users' group and add the user account running the SysGauge system monitoring application to the group.